HARRY Potter’s iconic ‘Privet Drive’ house has gone up for sale. 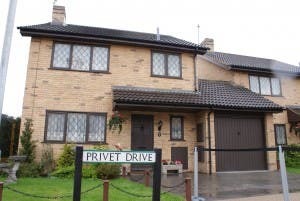 Based in Bracknell, near London, the property was chosen in 2001 to be the home of the Dursleys and was where a young Potter, played by Daniel Radcliffe, first lived in the cupboard under the stairs. Super fans with a spare half a million euros can purchase the piece of cinematic and literary history for €554,000. J K Rowling’s Harry Potter books topped the charts in Spain and across the world, as did the film adaptations.